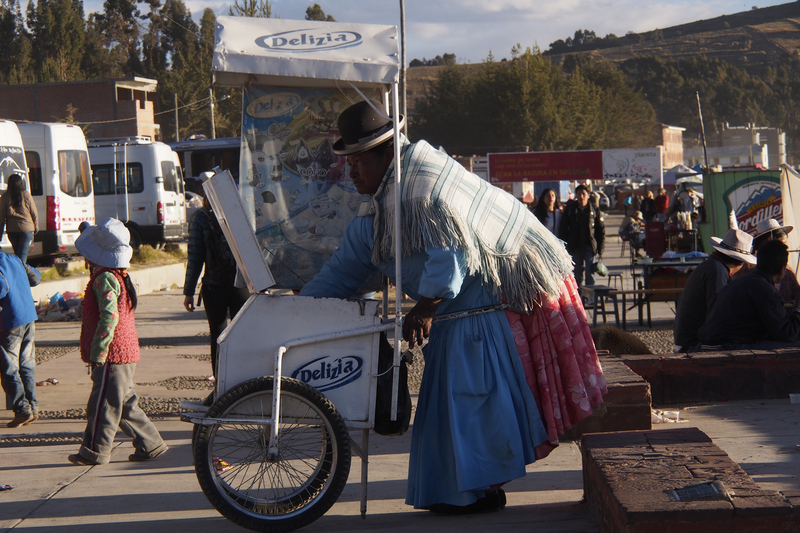 It was good to leave the frantic environs of El Alto. It took us a couple of hours to cycle out of the city. Our progress was hampered by a couple of large Independence Day parades creating gridlock. We eventually found a side road parallel to the highway which got us out of the chaos. 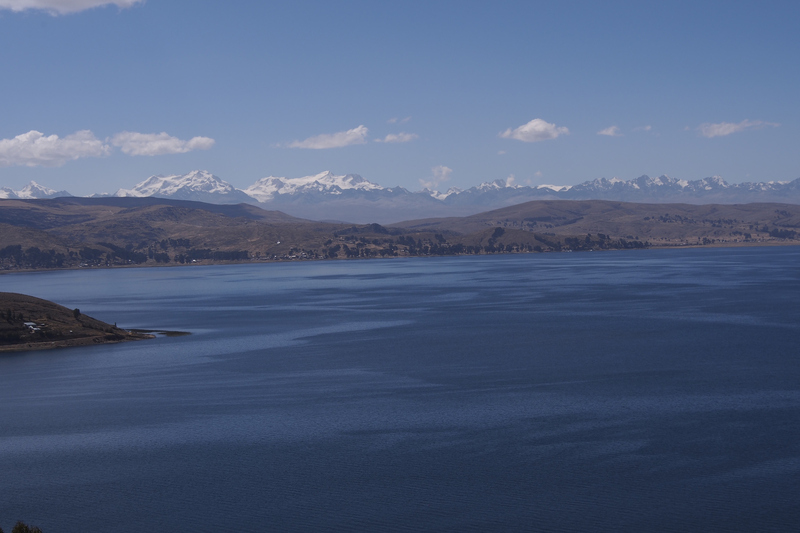 By mid afternoon, Lake Titicaca came into view as we cycled along a fairly quiet road on our way to Copacabana. 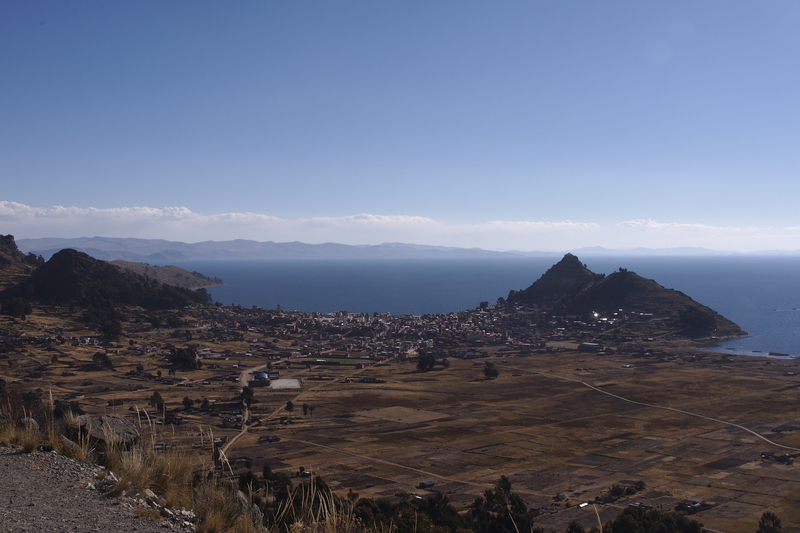 Lake Titicaca along the road to Copacabana with the Cordillera Real on the horizon. 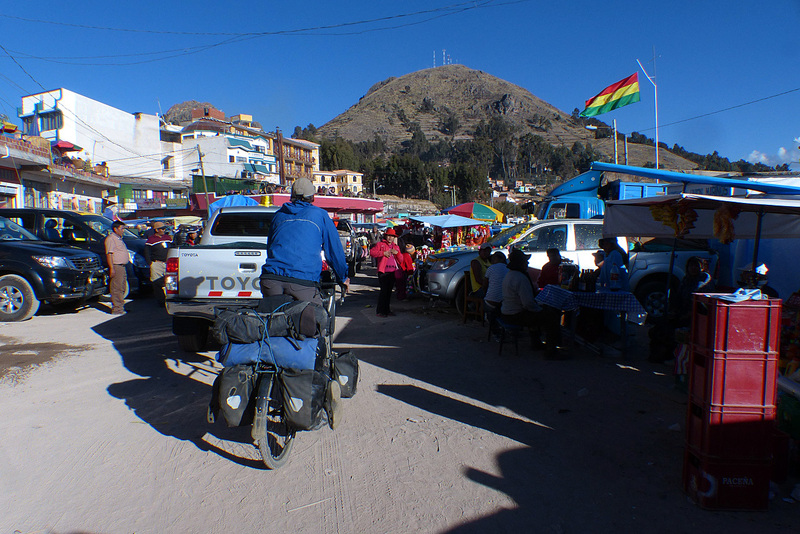 Two days, a scary ferry crossing and yet another mountain pass over 4,200 metres later, we arrived in a very busy Copacabana. 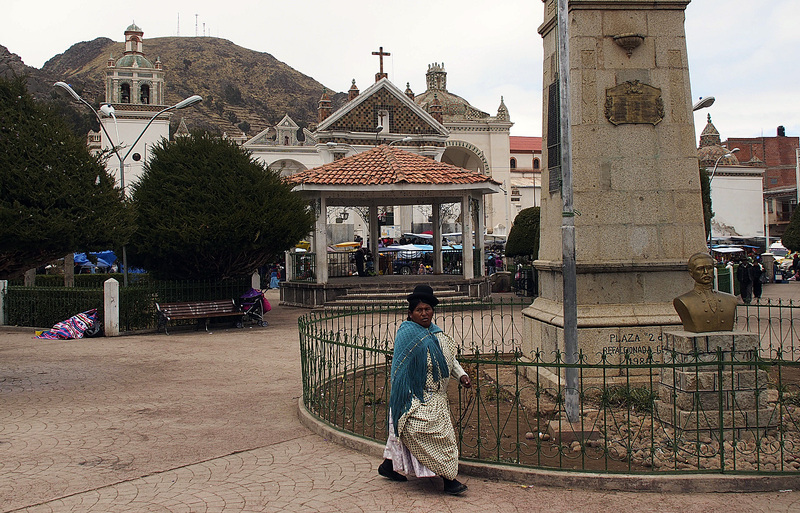 Ellen and Elmar took a bus the second day because Ellen’s bout with Montezuma’z revenge recurred. They arranged a hotel for the four of us and we were reunited in the afternoon. 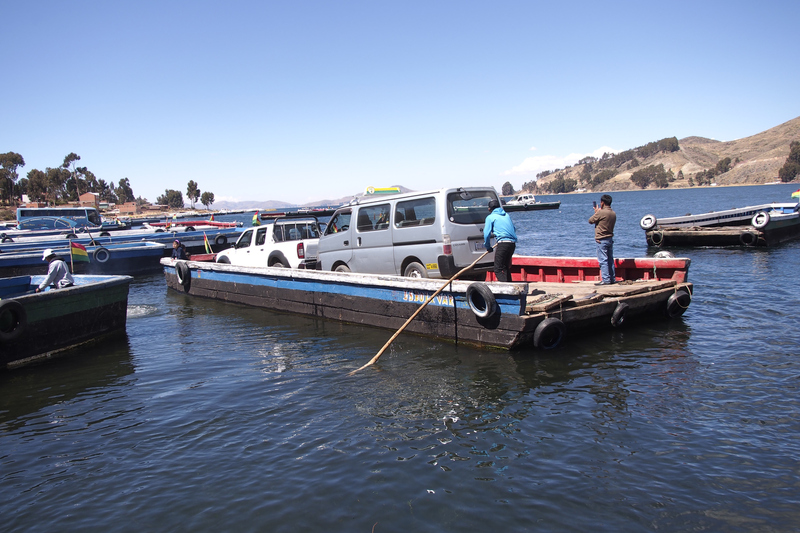 Ferry crossing at San Pablo de Tiquia. Jan climbing the pass on our way to Copacabana. 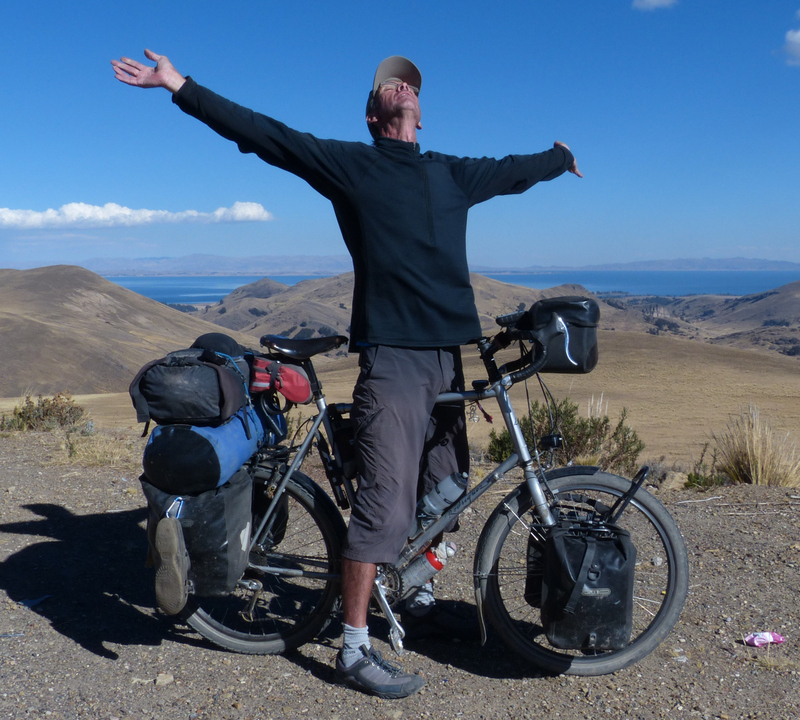 After two and a half hours and 27 km of climbing Paul celebrates arriving in the pass above Copacabana at 4,260 metres. 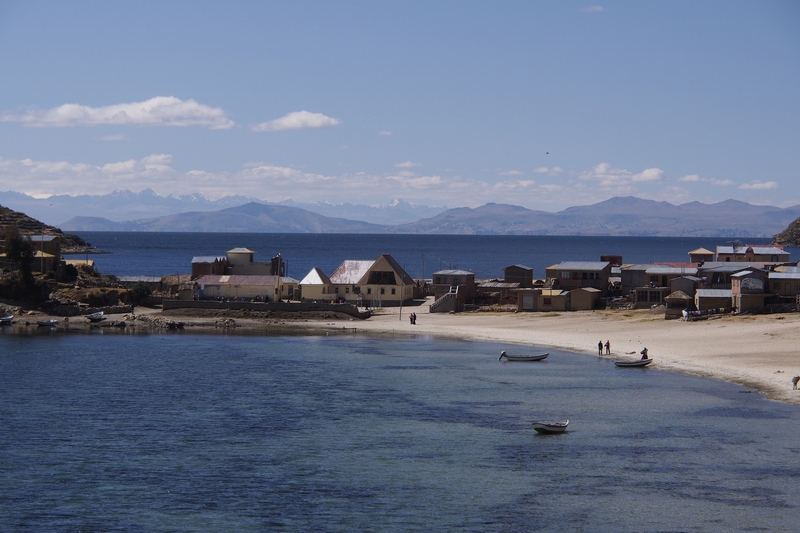 Copacabana on the shores of Lake Titicaca. Because of illness, we spent more time in Copacabana than we had planned or wanted, but what are ya gonna do. 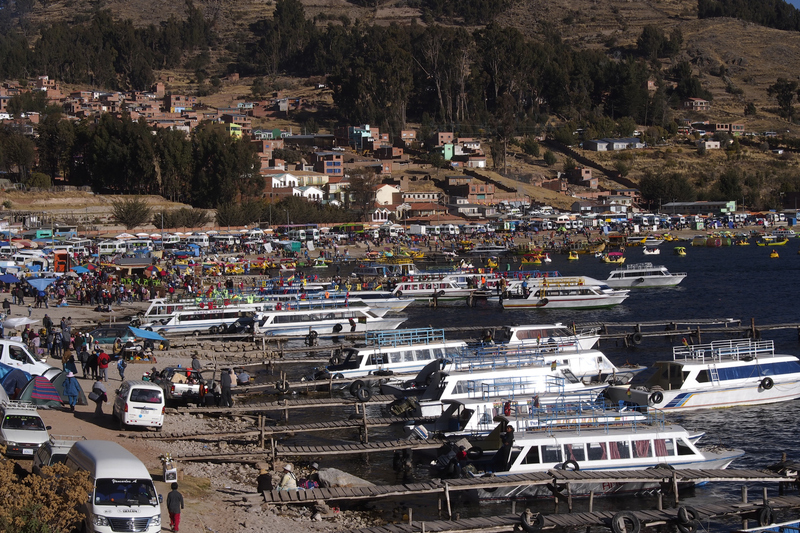 There was lots of entertainment in the form of masses of Peruvians with new cars in town. 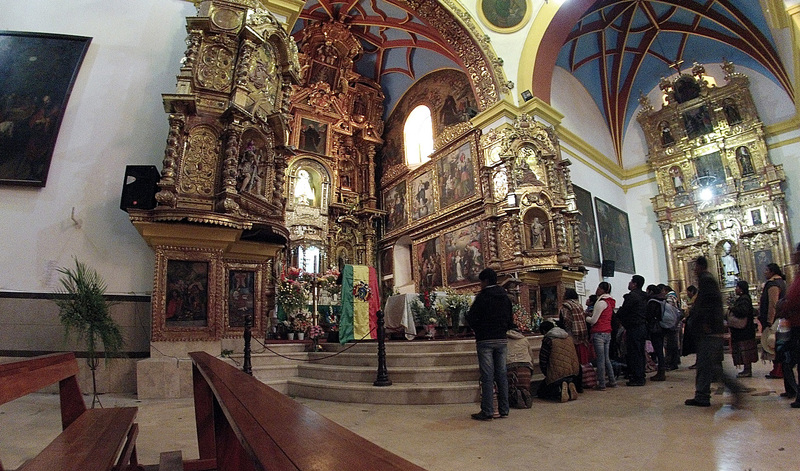 The reason: to have their vehicles blessed by the priest at the Cathedral of the Virgin of Copacabana. Cheap insurance, I guess. Trying to negotiate the busy streets of Copacabana. The gang reunited in Copacabana. 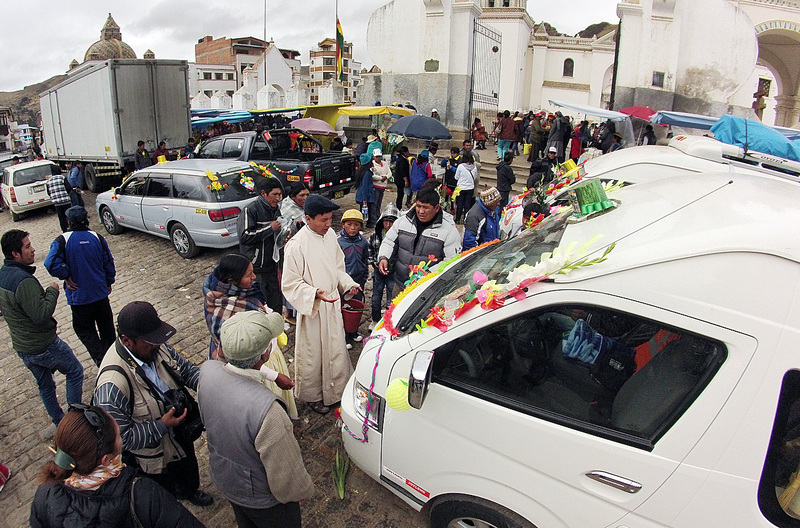 The priest blesses a car at Copacabana Cathedral. 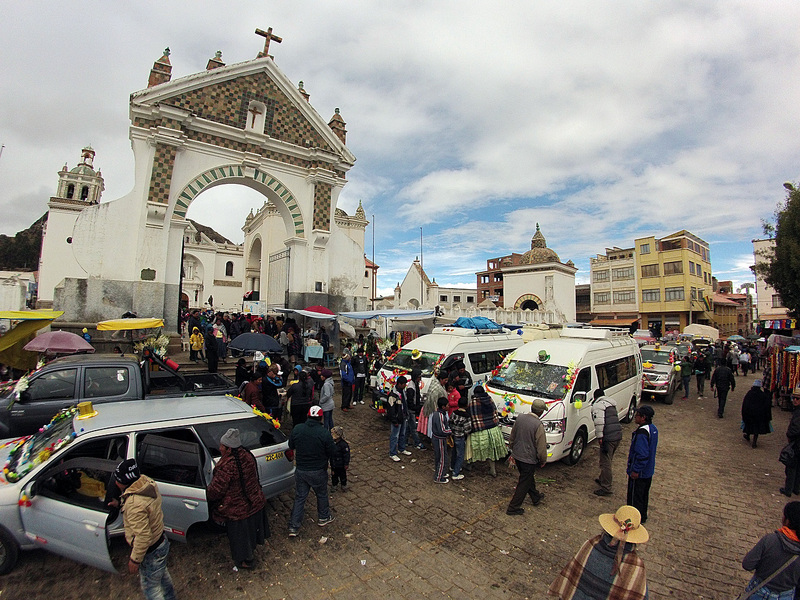 This blessing ceremony is usually lathered with a great deal of alcohol that is poured on to the gaudily decorated vehicles and into the drivers. It is quite a spectacle. Cars outside Copacabana Cathedral waiting to be blessed by the priest. 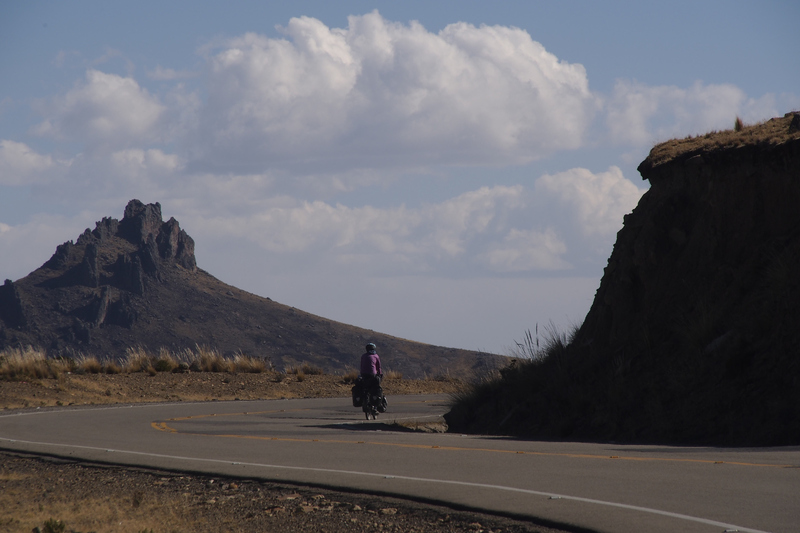 We also made a day trip to Isla Del Sol to see some Inca ruins there and just to get out of town and the mayhem of drunken new vehicle owners. 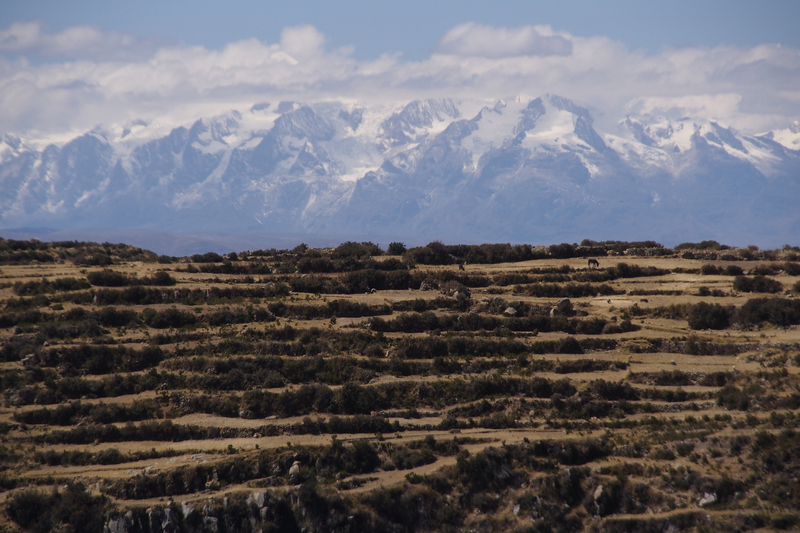 Terraced hillside on Isla Del Sol with the Cordillera Real to the east. 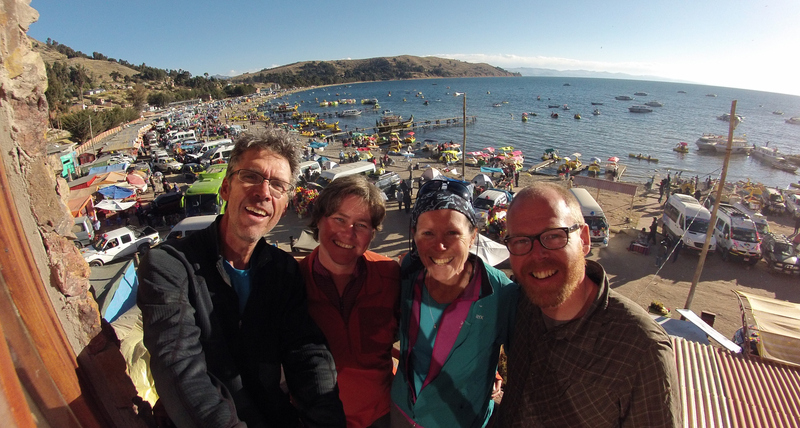 Eventually, everyone was well enough to cycle and we kissed Copacabana goodbye to cross the border into Peru on our way to Cusco. 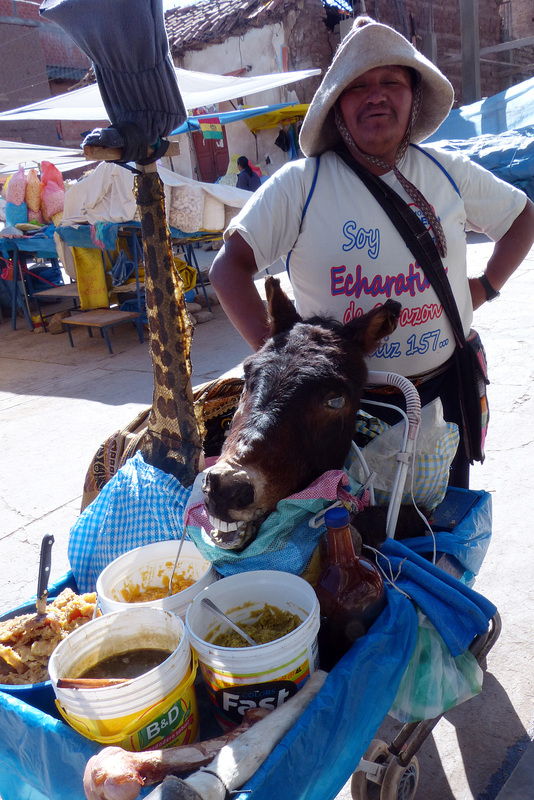 Yes, that is a donkey’s head. 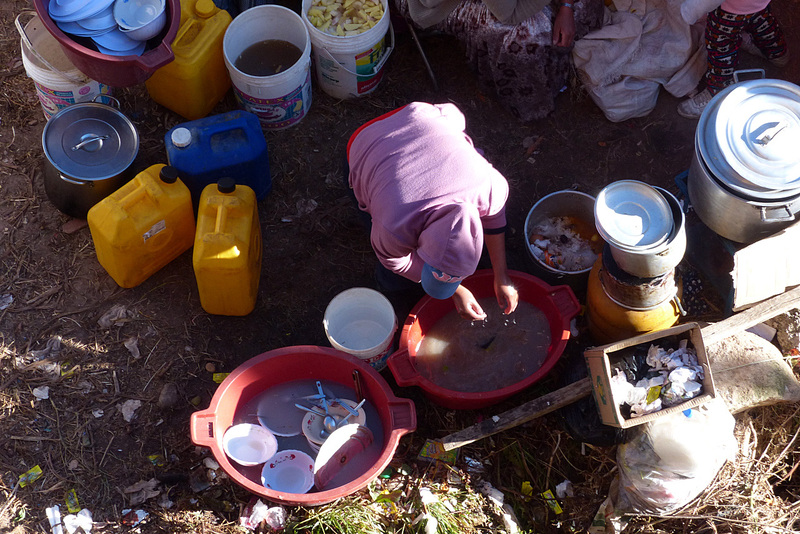 Washing dishes in not so clean water behind a beach-front food stall. No suprise people get sick. Ice cream vendor on Copacabana Beach. Plaza 2 de Febrero and Copacabana Cathedral. 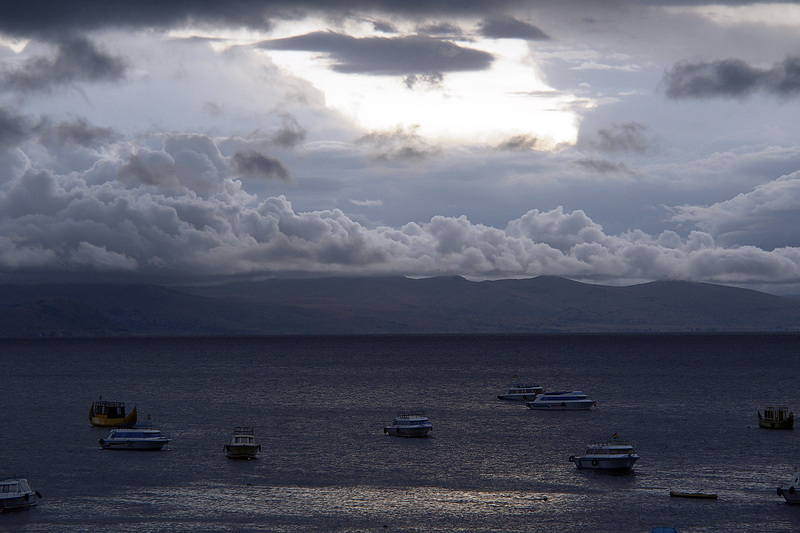 Sunset over Lake Titicaca and Copacabana beach. 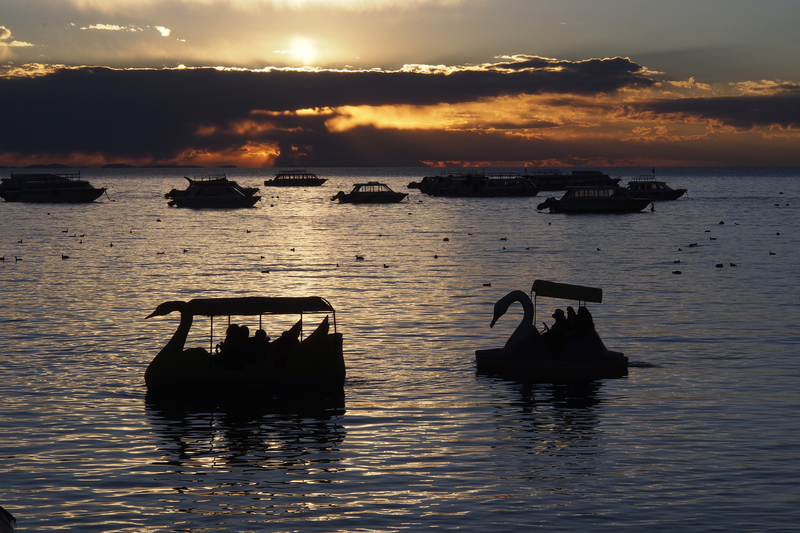 Paddle boats at sunset off Copacabana beach. Hi Stephan, Thilde, Antonia and Lara, Nice to hear from you. Hope you have had a great summer with some adventure. Yes, a year ago already. Time flies. 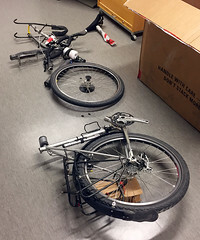 Glad to see you and Lara are planning a bike trip. You will love it. We are nearing the end of ours with mixed feelings but it will be good to get home after all this time.